The Artistsbook Library greets you as you walk through the alley and into the door of Proteus Gowanus, a unique space situated on the Gowanus Canal in what once was industrial Brooklyn. Among exhibition spaces, Proteus Gowanus remains an anomaly. It is an amalgam of moving parts; its exhibits and programs are fed by seven non-profit partners, and by an expanding community of artists and individuals from diverse disciplines. 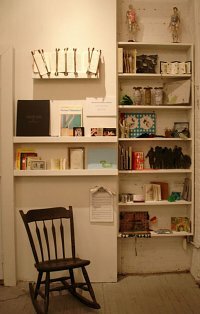 Art, objects, artifacts and books are exhibited, organized around the concept of an annual theme that often leads to sub-themes. It is an organic space, with the The Artistsbook Library situated comfortably within the area designated as the Reading Room, complete with chairs for the browser to take the time to visit with the books on an intimate basis. Visitors are integral to the process of what Proteus Gowanus is, as Sasha Chavchavadze, the founder and director, is open to discussion and ideas, an observation made, a suggestion by association dropped. It was out of conversations with one such visitor, Andrew Beccone, a recent graduate of the Pratt Institute School of Information and Library Science, that the idea for a year-long “Library” theme grew. It is a topic that is captivating the minds of many people today, from the history of libraries and their elaborate cataloging systems, to the challenges facing libraries as they confront the web. The visual, conceptual, and metaphorical implications of the theme have inspired work in the arts, and a flowering of small alternative libraries has appeared around the country as the role of library, and the book itself, is questioned. The Artistsbook Library’s curator Maddy Rosenberg is particularly concerned with this questioning. 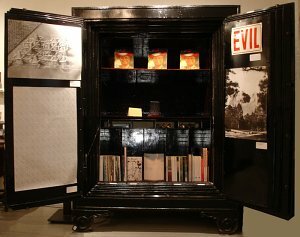 Throughout her previous curatorial projects (including A Tale of Two Cities with Sarah Bodman and Miriam Schaer, Beyond the Page and, most recently, Dialogue) as well as in her own work, her interest has been to look at the book as more than the repository of information as it crosses the line to become an art object in its own right. What library is complete without its collection of art books? But when the book becomes the art? These books take on a life beyond the source of information of a reference library. They are the art pieces more commonly photographed and documented than ordinarily found nonchalantly placed within a bookshelf. The Artistsbook Library displays the work of more than 30 artists, from pamphlets to highly conceptualized sculptural work. Here the idea of the book within a library becomes more than merely a container for knowledge and the bookend is none other than book art. 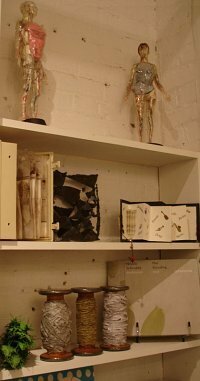 Miriam Schaer’s Body of Knowledge, which takes plastic models of the male and female human figure with books formed by the “Atlas of Surgical Operations” nestled within the chest cavities, presides over the bookcase from atop it. The altered book takes on a personal meaning as the pages originally belonged to a text of the artist’s doctor father. For Schaer, it was the realization that the processes of bookbinding and surgery had much in common: cutting and sewing to make something whole. From the rocking chair placed conveniently by the Library, a visitor can sit and contemplate three works from Robbin Ami Silverberg’s series of Proverbial Threads, in which she wraps industrial spools with strips of paper that repeat, like a mantra, less than complimentary sayings from around the world pertaining to women. Though with Territory: a poem, Leah Oates has a lyrical take on women in traditional roles, crossing boundaries and finding other manners of being in the world. Or, should one prefer a more hands on experience, slowly comb the pages of a flag book by Patricia M. Smith, her latest story of the red dress; get a taste of the work of Texas printmakers/ poets/ performance artists, the brothers Charles and John Hancock; delicately turn the rich leaves of Florence Neal’s prints which she interweaves with the text of Moroccan poet, Abdelkrim Tabal; and meander through the printed and cut accordion book of Mary Ting culled from her 3 year experience of living in China. Emma Hill, of Eagle Gallery in London and noted for her long-time interest in the book arts, is represented by a number of works from her press, EMH Arts, in which she collaborates with other artists and writers. The elegant prints of Nicola Schrudde are caranicino and Andrew Bick in Variant collages together his work and notes in facsimiles of his kept notebook. Eileen Arnow-Levine offers her complete inventory of 8 pamphlet books of stories written and drawn by her. Her words belie the beauty of her stark black and white drawings in tales of the macabre. Martin Mazorra takes black and white printing in another direction in Character Flaws: A Comedy of Mannerrors; utilizing letterpress, linocuts and both wood and lead type, he skillfully carries us off into his flights of fancy. While neophyte book artist Geoff Green delivers the saga of a tortoise and its quest for a strawberry in a flip-book form, housed in its own cloth covered slipcase. In The Safekeeper, Kerry Downey literally incorporates the local earth drawn from a basement in Bedford-Stuyvesant within a found object, mixing it with paper, pencil and wax and filing it into the plastic inserts. Scottish artist Andrew Eason, who began making books by manipulating digital images, has now returned to a more focused concentration on the incorporation of the hand. His Clock Watching fits within the palm, still carefully covered and bound by the artist. And Karen Sasha’s hands do somersaults as they climb the jacob’s ladder of Hot Potato. We then turn to the interactive artist’s book, one that asks us to be an engaged participant to complete its meaning, as in Susan Rotolo’s MUSIC ~ Rhythm In A Book, a noisemaker that beckons us to hold it by its handles and ’play’ it like an accordion. Doug Beube uses a system of zippers to create a piece with endless variation in the highly conceptual yet beautifully crafted Interlocutors, as pages can be added, deleted or interchanged at will. Bob Heman turns his poetry into a conceptual object in Guilt, printed on flat sheets of paper, he then asks us to cut them out, fold and glue to create geometric objects that can be turned and read plane by plane. Or not. Roaming about the large open space of Proteus Gowanus beyond The Artistsbook Library, will bring one in contact with a four ton 1900 safe containing a library and store of Cabinet Magazine’s current and back issues, with a central revolving mini-exhibit. Continue on to a library of contemporary “chained books” created by Wendy Walker, a display of books and images of the 17th century chained libraries, existent still in contemporary England. 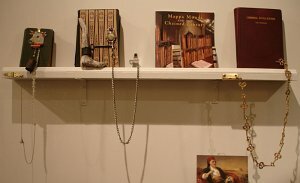 Walker has added her own artist’s books, chained to the shelf and place. She is joined by fellow novelist and Proteus Gowanus Library Correspondent Tom LaFarge, as they promise us with a tour of burned, bombed, chained, rejected, and rotting libraries around the world, as well as workshops on the French-based OuLiPo, the first literary movement to apply mathematical constraints to verbal composition. And we find Andrew Beccone’s own contribution of the Reanimation Library, a small, independent library serving artists, writers, and other cultural archeologists with its recycled volumes. Other intriguing exhibited items include a collection of crocheted models of hyperbolic space and related mathematical books from The Institute For Figuring; a library of rare and new travel books including recommendations by Philip Lopate, Vijay Seshadri, Jonathan Ames and other Brooklyn-based writers; and an original card catalog from a 1930’s private library, complete with Dewey Decimal System shelf markers, provided by artist Alexandra Walcott. In a separate room of its own can be found the culmination of the artistic vision of Sasha Chavchavadze, the complex and multilayered ongoing Museum of Matches Project, with an archive of Cold War books. 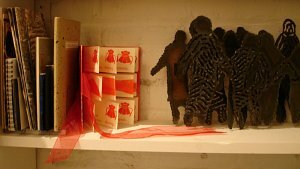 In its own way, the Museum of Matches Project is indicative of Proteus Gowanus, as it is a deliberate assembling of eclecticism.